Just getting into matchlists. Super useful. I'm not sure I really understand 2). Do you mean you want to use the settings from Smartlists or Matchlists as filters or you want to base new Matchlists based on the tracks from other lists? 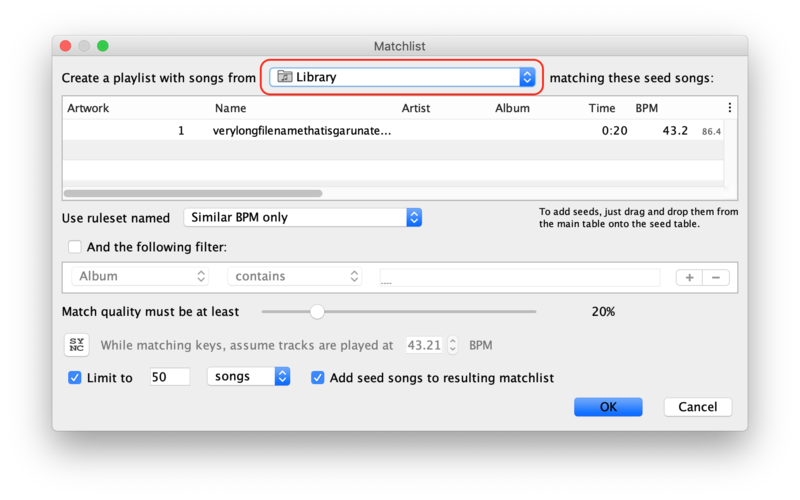 I’d like to use an iTunes playlist and/or a BeaTunes matchlist as a filter in a BeaTunes matchlist. Isn't that at least partially already covered by being able to specify the source playlist (see attached screenshot)? Almost - but it needs to be one level down in the hierarchy so that we can specify multiple playlists/match lists and use AND and OR functions. I'm afraid, I don't really have the resources to implement this in the foreseeable future.